Am I killing our bees? Amelia and I spent two week in the UK in late October. Before our departure we were so happy with our bees. They had given us loads of honey and all the frames of each of our five hives were either full of brood or honey reserve. This was much better than last year at this stage, when we had to remove three empty frames from Violette and two from Poppy and place a partition in their hives. 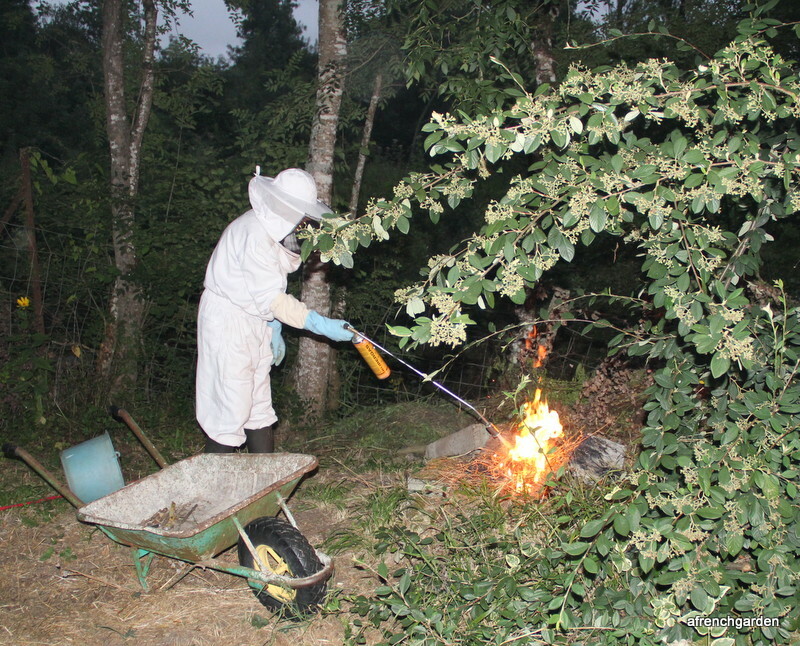 During the Spring of this year we had captured over a hundred Asian hornets – mostly queens – and as the result we had noticed very few attacks from the hornets during August, September and even October. Despite that I had left several frelon traps not far from the hives. On our return from the UK, we went to the hives immediately, even before entering the house. What we found just broke our hearts. The hives were being badly attacked even though it was late in the evening. We noticed that the Asian hornets appeared to be smaller than the previous year and they were coming out of the hive we call Iris. She was our youngest division from Violette and in October she had a large brood and all frames at the sides were full of honey. She had even given us honey. The next day I opened Iris as there did not appear to be any guard bees. I noticed a very small brood in the middle two frames but only a small handful of bees on them. I could almost cry! We had already bought hive muzzles and decided to place an entrance reducer on some of the hives and the muzzles on others. Maybe it is the case of closing the stable door after the horse has bolted. Maybe as far as Iris is concerned we have lost her. Just above the metal mesh, there is an entrance to the hive, but only some of the bees are getting used to entering through that entrance. The problem in any case is that the metal mesh in front of the muzzle has 6mm wide entrance for the bees. Theoretically they should be able to enter and leave, but some get stuck in the mesh, others do injure themselves or die. Others try to remove their dead sisters which makes it even a sadder sight to watch. I cannot decide whether the muzzles are helping the bees or harming them. My other problem is that I have fitted two of my hives with a small canopy which makes it even more difficult to fit the muzzle. On Violette with her canopy I had to fit the muzzle above the canopy so it is really badly fitted. Fortunately during the last few days it has been raining and there are less bees coming and going. I have not had the courage to fully inspect all the hives when it rains and disturb them even more, but I am seriously worried for at least three of the hives. A few days ago we found eight Asian hornets had actually managed to enter the space within the muzzle of Iris. Once inside the muzzle the hornets do not attack the bees and appear to panic. Eventually they die. I watched Poppy’s guard bees actually attack two hornets inside her muzzle and eventually killed her. But to be honest I am getting desperate. Perhaps someone – not necessarily a beekeeper – can suggest a better design for the muzzle that would protect the bees without killing them. For the moment I am not sure if I am hurting them more than protecting them. Categories: Bees | Tags: abeilles, anti hornet guard, asian hornet, bees, frelon asiatique, muselière anti frelon, Vespa velutina | Permalink. There are those beekeepers who maintain that the bee keeping year ends at this time of the year; others believe that the year really starts after the honey harvest as one prepares the hives for the coming year, looking forward to the Spring collection. Whatever the merit of the discussion, I feel that the work and the pleasure never ends. 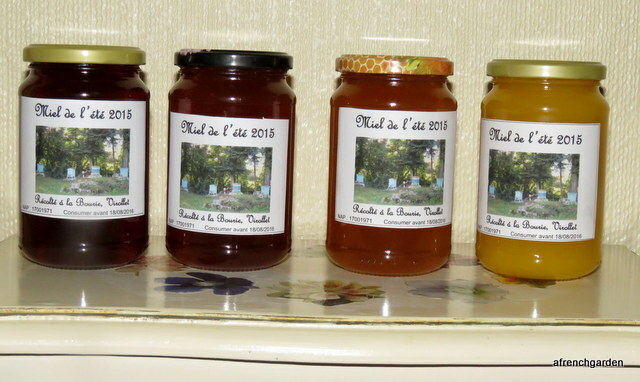 Michel advised us to go ahead and collect our honey a few days before my granddaughter’s visit to France so that the bees calm down after we have stolen their reserve of honey. Being our first harvest, I followed the advice of using an escape board on the two hives with supers. I placed them on the hives on a sunny evening and the bees were quite content to let me do it without using the smoker that I had prepared. 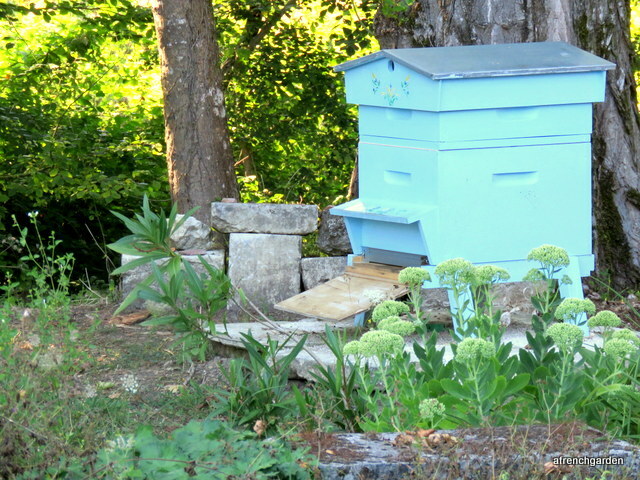 The following morning at 7 am, Amelia and I temporarily closed all four hives by way of precaution, and opened Cornucopia which had two supers. 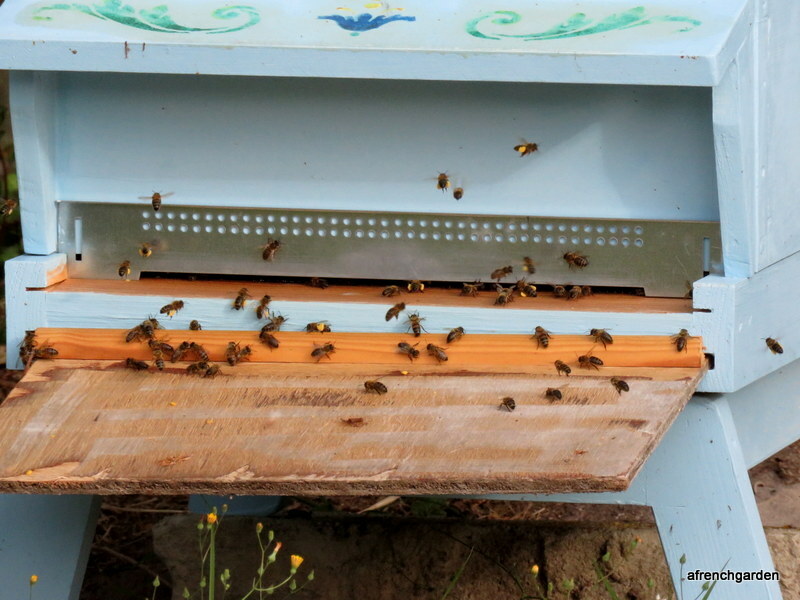 There were indeed very few bees left on the frames and we easily brushed them off and placed the frames of each super in a separate box closing the lid after each transfer. Opening up Violette was even easier as she had only one super. None of the bees seemed disturbed by us taking their honey and once again the smoker lay unused at the side. 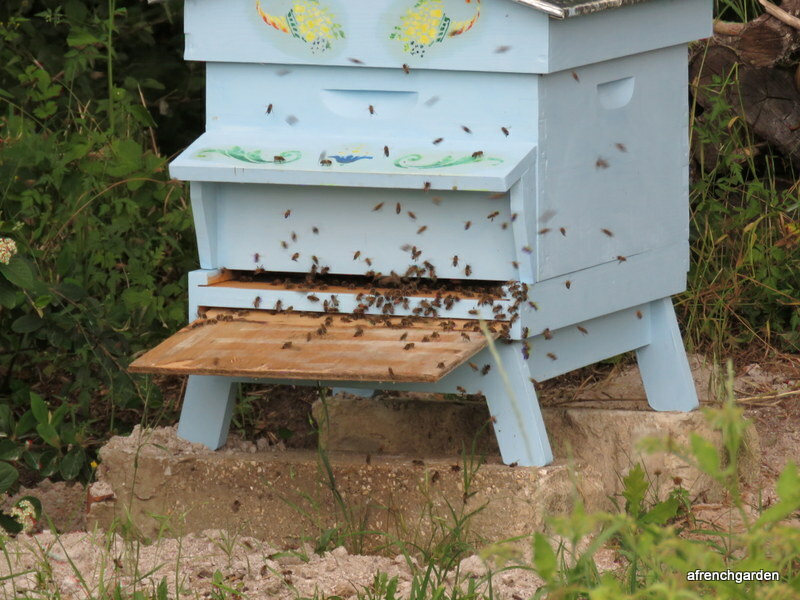 In fact, it was only the few stray bees left in the supers and the early birds returning to the hive that were very concerned that their hive was closed. Once we opened the hive doors all returned to normal. Violette is Amelia’s special favourite hive; once she saw the queen, she was smitten! I admit that her bees appear to be the most gentle of all our hives. We took the three boxes with our frames to Michel’s house where he has a special room with all the equipment necessary. There is little merit in going through every step for the extraction, as everybody who has already done so knows how rewarding and pleasurable an experience it is. 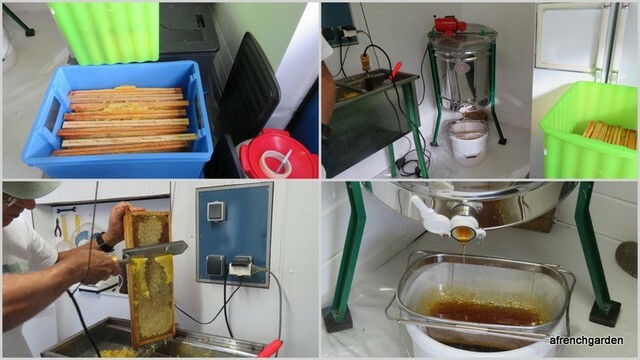 Michel was particularly keen that we keep the honey from each of of our hives separate, including the un-centrifuged honey obtained from the cappings. We kept the separated honey for a week in 10Kg containers before bottling them. Being a complete novice I was pleasantly surprised to see that from three supers, we ended with four different colours of honey, the fourth being the un-centrifuged honey from cappings. The hard work was almost over. Our next task, after letting the bees clean their frames, was to start treating them against varroa. Based on the advice of our regional bee health service, we have started three course of “Apilife Var”, which is an essential oil from thyme and other plants. It is most effective in temperatures of 20-25 degrees C, which was about the temperature when we started the treatment. Unfortunately for a few days the temperature rose to around 34C in the shade. At that temperature the fumes generated could affect the larvae and in addition the bees don’t appreciate the smell. So we had quite a lot of bees sitting outside the hive, and that left them easy prey to the Asiatic hornets which constantly come and pick the bees one by one. It is heart breaking to watch this. Amelia and I stand guard several times a day catching the hornets with a child’s fishing net. We can win the battle of the moment, but we are not winning the war. At the end the bees appear to have resigned themselves to some casualty. The flowering season is not over yet. The garden is still full of flowers and the bees are quite busy. The ivy has also just started to flower in the forests around our house. I am glad to see that in the interval between the removal of the supers and two weeks that have passed, the bees have added a considerable amount of additional honey stock for their winter reserve. 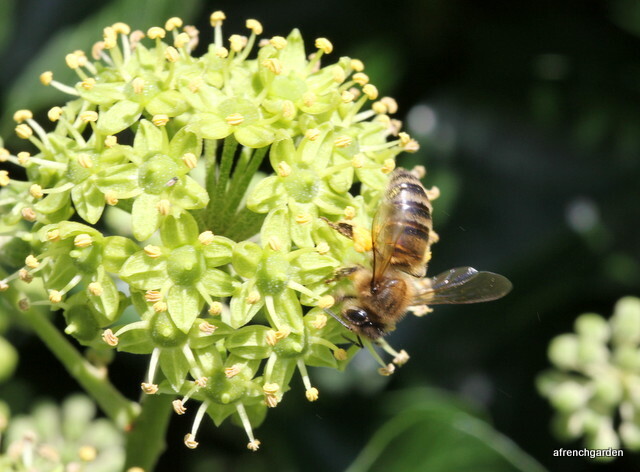 The only annoying thing is that the hornets are also visiting the same ivy flowers. I try hard to accept the battles of the bee life and Amelia and I try to protect our “girls” against the predators as well as the unusually hot days the best way we can. 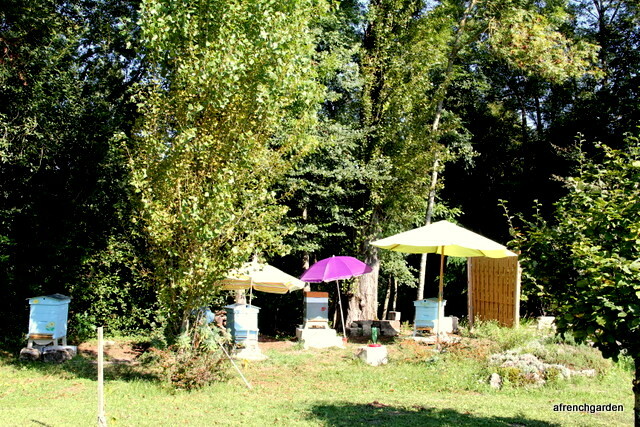 Categories: Bees | Tags: bees, frelon asiatique, French life, gardening, honey, honey bees | Permalink. I apologize that this post is less about garden more about bees and it definitely carries a warning as it is not for the faint hearted. During the past few days our precious honey bees have been attacked by asian hornets – frelons asiatiques. I noticed it first when I saw a huge agitation around the hives. Amelia stood guard yesterday and the day before with a butterfly net and on each occasions trapped and destroyed four or five asian hornets, some were trying to enter the hive. Altogether she must have caught a dozen hornets over the past few days. 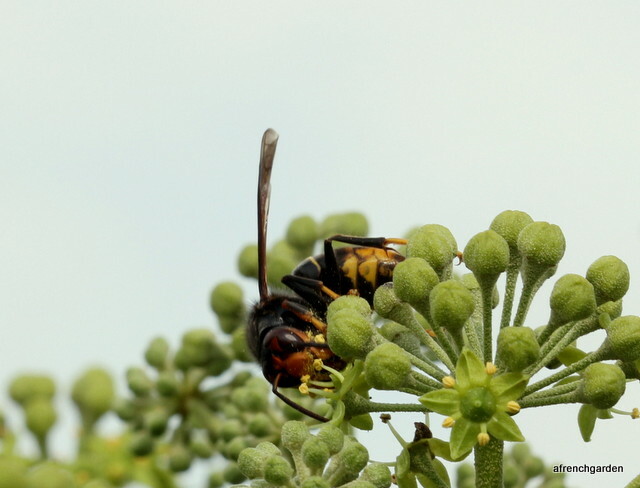 It is worth mentioning that despite their size, the asian hornet is not particularly aggressive towards humans and mainly is interested in catching bees near the hive, cutting their head and taking the body to feed their larvae. Sometimes they enter the hive and take bee larvae for the same purpose. 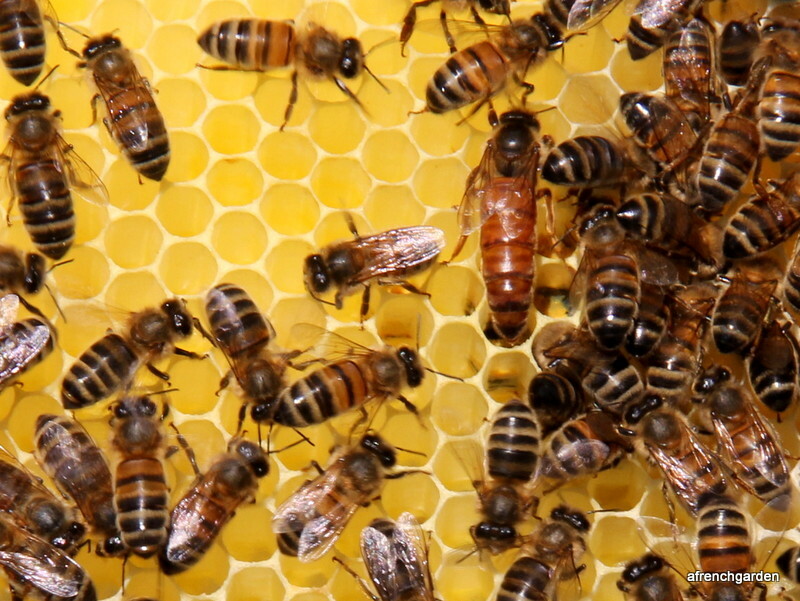 A full colony of asian hornets in season can considerably weaken and even destroy a bee hive. Normally the asian hornets are a problem in this region during August. But yesterday I was working along what we have named our forest walk next to the river Seudre. I noticed a couple of asian hornets landing on the steps I had created. 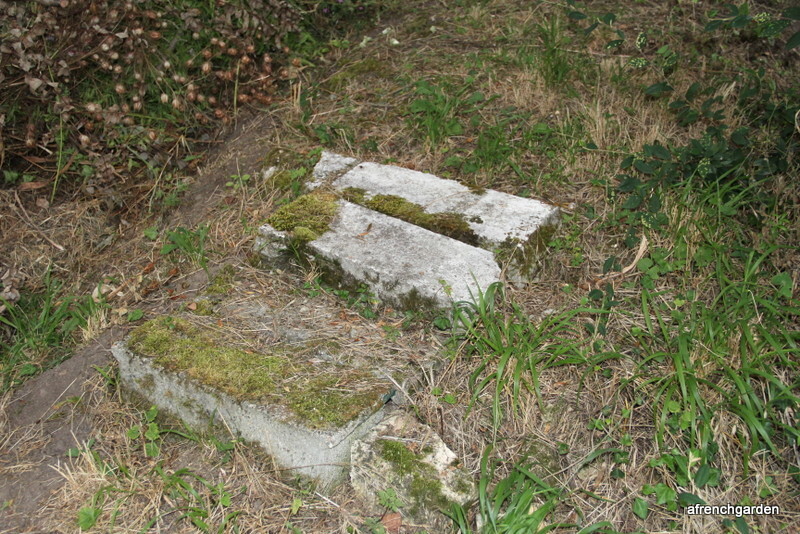 The steps are made from hollow breeze blocks. There was no mistake that they were Asian hornets entering and leaving an underground cavity. Searching the internet there is a considerable amount of information on the asian hornets in France and their nests in trees. I found no information on any underground nest. 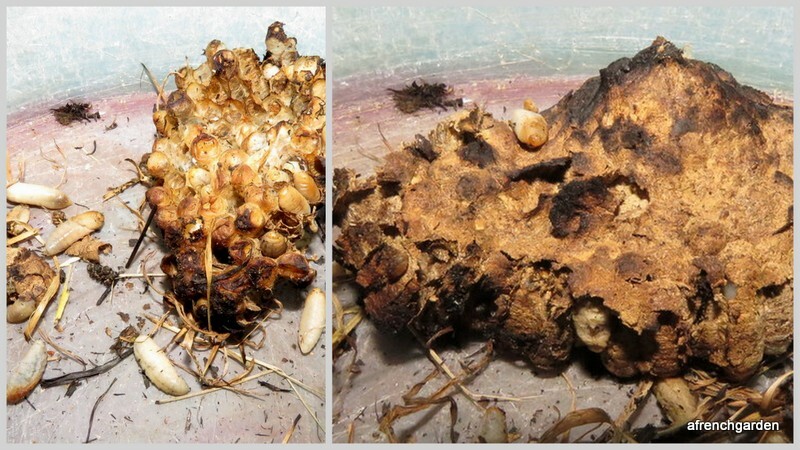 However, what I am beginning to believe is that the hornets do make a small nest underground at the beginning of summer where new hornets are raised, presumably as future queens. Later each can develop a new larger colony in trees. Britain has been so far spared by this new menace to bees, as was France before 2004. The asian hornets are moving north and there might not be too long before they also enter Britain. Operation destruction had to be put in place when night fell and hopefully all the hornets had returned to the nest. This consisted of first placing straw and sticks on the site and setting fire to it. Kitted in my bee suit and armed with the propane burner used normally for destroying weeds, I went into battle. Then we turned the stepping stones over to find the nest and then placed more straw on it and in the hope of burning the area where they nested. 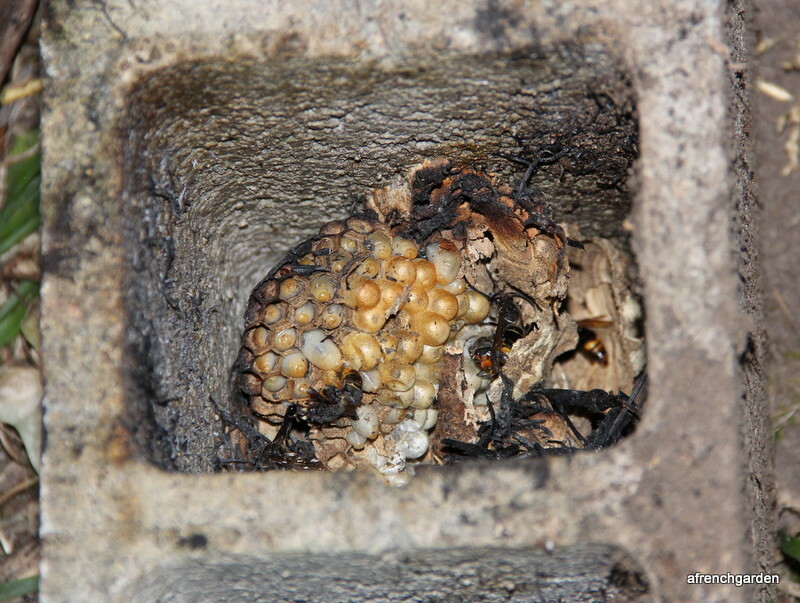 The hornets caring for the larvae were there but already overcome by the smoke and heat of the fire. The night had fallen and it was already ten o’clock, but my next move was to install hornet guards at the entrance of each of the hives, whilst the hives were quiet. The guards were there, but they were quite gentle. This morning I went to check that the hornet guards were not too much hindering the bees leaving and entering the hives with pollen. All appeared well and I could see lots of yellow pollen brought in from the fields of sunflower across the road. 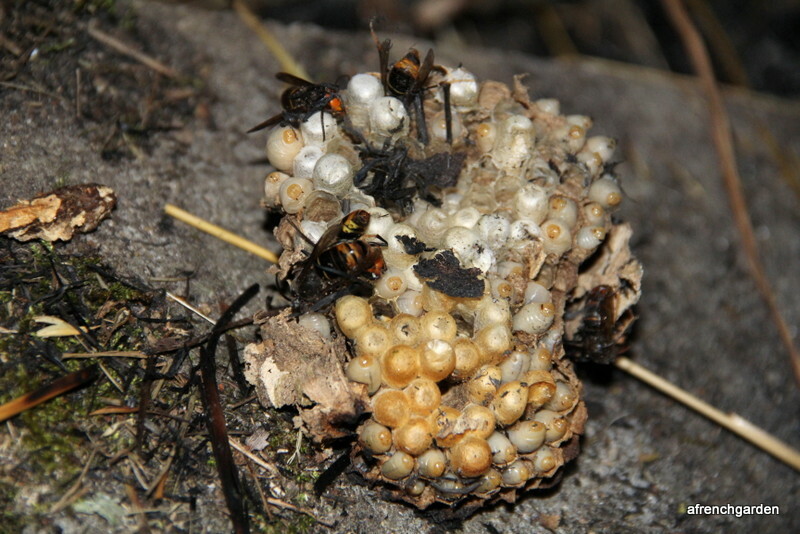 I checked and removed the partially burnt out hornet nest and saw the clear papery nest with its pointed back where it was attached to the breeze block. 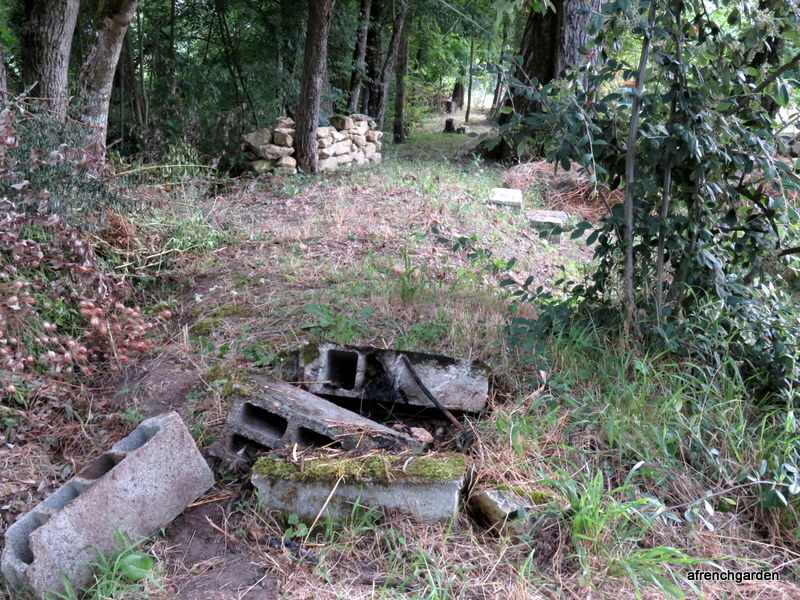 The steps to our forest walk has to be rebuilt. But should I use breeze blocks again? That is a question that requires some thought. Meanwhile, I am hoping that our bees have been given some respite from the asian hornets. 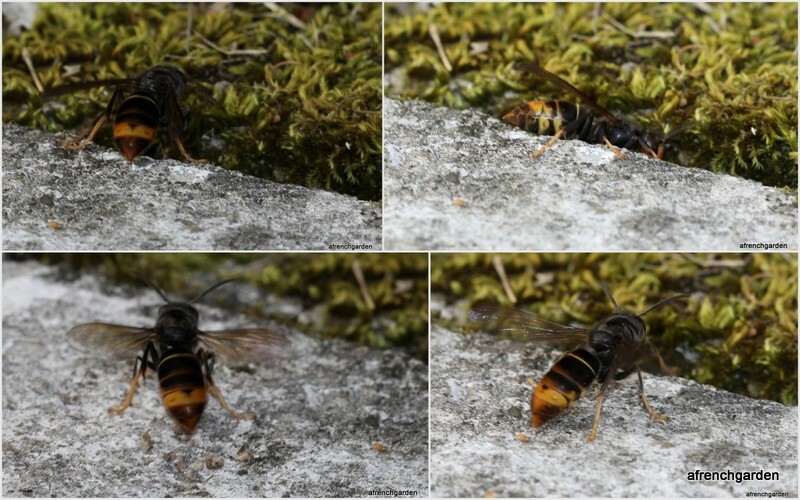 Categories: Bees | Tags: asian hornet, bees, Charente Maritime, France, frelon asiatique, French life, gardening, nid souterrain frelon asiatique | Permalink.